Resources for writers with little time and even less money, who are on the journey to publication. I love historical fiction, and Deeanne Gist is one of those authors who you know will deliver a great story, wonderful characterization, and the zing of romance. Gist's latest novel, Tiffany Girl, releases today. SYNOPSIS: From the bestselling author of It Happened at the Fair and Fair Play comes a compelling historical novel about a progressive “New Woman”—the girl behind Tiffany’s chapel—and the love that threatens it all. 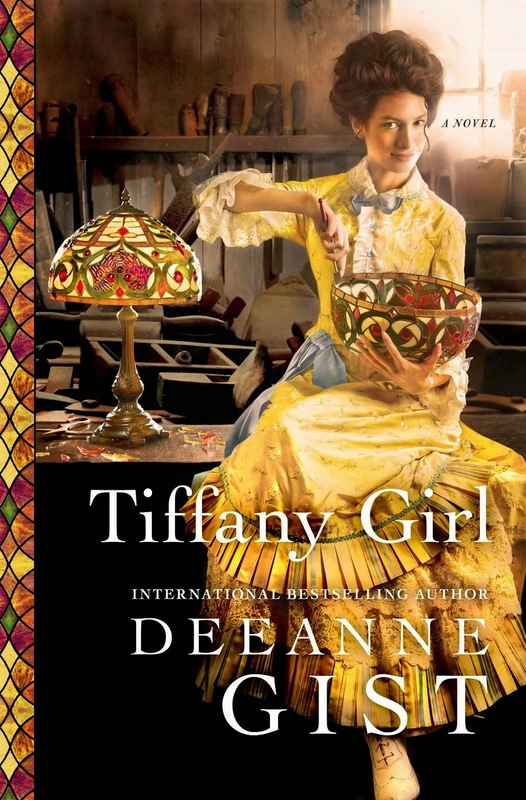 Tiffany Girl is the heartwarming story of the impetuous Flossie Jayne, a beautiful, budding artist who is handpicked by Louis to help complete the Tiffany chapel. Though excited to live in a boarding house when most women stayed home, she quickly finds the world is less welcoming than anticipated. From a Casanova male, to an unconventional married couple, and a condescending singing master, she takes on a colorful cast of characters to transform the boarding house into a home while racing to complete the Tiffany chapel and make a name for herself in the art world. As challenges mount, her ambitions become threatened from an unexpected quarter: her own heart. Who will claim victory? Her dreams or the captivating boarder next door? Gist's characters Flossie and Reeve will pull you in and keep you turning pages. I handed the book to my husband the other night and haven't seen him except for meals. You can read more about the characters here. Through a special arrangement, readers can buy the book at a 30% discount from Givington's. Not only will readers get a great deal, but $1.50 of the purchase will go toward an organization helping kids with dyslexia, which Gist herself suffered from. If you belong to a book club, Gist has not one, but three different free book club kits available for download. Choose the one that fits your group the best. Also, head over to Gist's site to enter a contest for a great bathtub reading kit. What was the last book you read? Leave a note in the comments. I love a good book review and this one does what all good reviews should do...helps the reader make an informed decision. I now have three books to add to my list. Thank you. Just to say I love the title of your blog - "Writing While the Rice Boils" . It just sums me up to a tee. I put the potatoes on and then start writing and the time evaporates as does the water in the pan and the smell of burning wafting into my study is the first I know about it. I love Maggie also. My recent fave is Hunted, by Meagan Spooner (Beauty and the Beast retelling). Thank you so much for saying hi! I'm a homeschool mom, desperate for more time to write. I love to encourage other writers, and share what I've learned so far. I'm finishing my second novel and researching my third, I'm a freelance writer and editor, and I homeschool four teenagers. They're the reason I write while the rice boils. Useful Tool for Contemporary & Urban Fiction Writers: The Urban Dictionary.